Cacao beans are the beginning of chocolate; cacao is the name for the bean before it is fermented for five days (usually under banana leaves), dried in the sun, and processed into cocoa powder. Cacao trees are grown around the world in tropical climates and most of the chocolate produced in the world comes from West Africa (mainly the Ivory Coast) and Central America. These crops are amongst the most highly sprayed food crops in the world and are often produced in plantation style. However, there are also FairTrade and organic chocolate producers using natural, shade grown sustainable farming methods with no pesticides. Carbon Gold, a company based in the UK, is taking sustainable farming one step further and is partnering with the Toledo Cacao Growers Association (TCGA) in Belize to add biochar to trees as a soil amendment. The initial drivers of this project are encouraging cacao farmers to prune their trees (to increase yield and reduce the instances of airborne fungi), investigating opportunities to provide nutrients to the soil organically, and offsetting some of the carbon emissions from annual operational emissions. Kraft is purchasing the carbon as a payment to farmers to use biochar. For the last two years, Carbon Gold has partnered with the TCGA who represent 1200 small-scale farmers in the region and produce cacao beans for Green & Black’s Maya Gold chocolate. Green & Black’s has been buying organic cocoa from the TCGA farmer’s co-operative in Belize since 1994 and is owned now by Kraft/Cadbury. The project has gone through a number of different stages to better adapt the biochar production to local needs through a very lengthy stakeholder engagement process. The group initially produced biochar with three batch Adam Retort kilns and although the retorts produced good biochar, the farmers found that the technology was not well-suited to their operations. The retorts were not mobile and required larger volumes of feedstock than the farmers had on hand. Tree trimmings were coming in from many different orchards in the area and sometimes had to be transported a long distance. The farmers found that they needed at least a ton of material before they could produce a batch of biochar—and that the production required at least one attendant (a farmer). Initial feedback from the farmers showed they were required to spend too much time in transporting the feedstock and producing biochar. Since the group could not find the type of production unit they needed already designed and built, engineers from Carbon Gold built their own in the UK. These kilns are a 5-foot adaptation of a ring kiln. 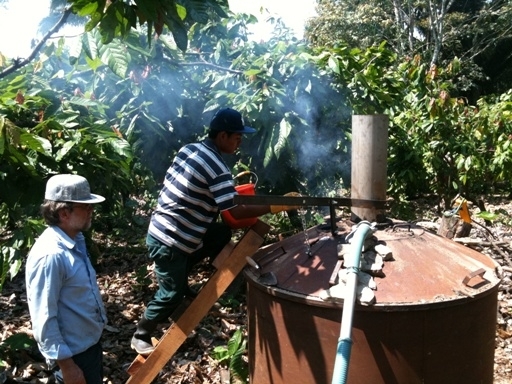 Ten mobile units were shipped to Belize in March 2011; having a mobile version will allow the unit to follow the cacao tree trimming schedule by moving from orchard to orchard to produce biochar. This will reduce transport of biomass and keep all the biochar produced to be used onsite by each orchard. The biochar is mixed with a blend of organic material and applied back to the cacao trees as a potent biochar-based soil fertilizer. The ring kilns weigh around 250 kg, so it is feasible to load them in the back of a truck to transport them between orchards. The kilns process 600 kgs of feedstock to produce approximately 150 kgs of biochar per batch, a significant increase in yield from traditional charcoal burning units. A single burn can be done in a working day, leaving the biochar to cool overnight to empty and reload the following morning. The Carbon Gold engineers have also minimized attendance time, allowing farmers to easily integrate the burn process into their day-to-day activities. Carbon Gold ran cultivation trials on cacao using biochar only, as a top dressing, on six participating farms in the region. Results have been positive with farmers observing healthier trees that have started producing fruits significantly earlier than the control sites. Kraft has now commissioned a further 2 year cultivation trial on more farms, using biochar blended as an organic fertilizer and incorporated into the soil during various stages of cultivation including seedlings, semi-mature, and mature trees. This may be expanded to food crops in the area as well which would provide an additional income stream to the cacao farmers. The trial results are generating interest at the farmer level in Belize and demand for biochar-based fertilizers. Carbon Gold is now generating awareness with the Belizean government and international NGO community to expand the project further. 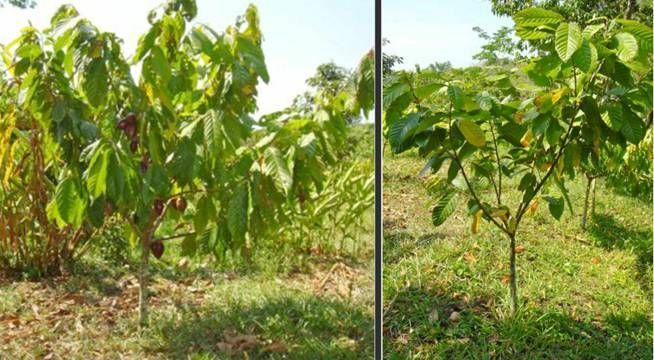 The organization hopes to use trial data to generate interest in other cacao producing areas around the world where farmers face similar issues of lowered productivity and rising input costs. 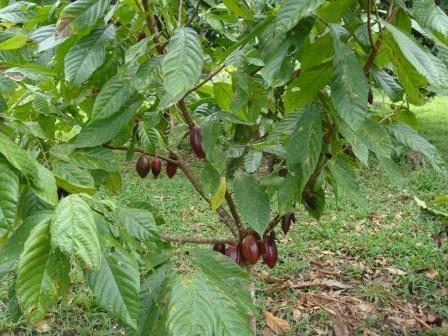 A 2.5 year old cacao tree producing fruits (pods) as part of the biochar crop trials (top dressing of biochar 18 months ago). Most Belizean cacao farmers have to wait for between 5 and 7 years before their trees start producing pods. Trees of the same age; the tree on the left has been amended with biochar and is producing fruits; the tree on the right is grown under standard conditions and has not had a biochar amendment.